Is 90% Pension Funding the Right Target for Illinois? Illinois’ pension law requires that State pension assets cover 90% of estimated pension obligations by June 30, 2045 and stay at that funding level thereafter. The law also requires that the Illinois General Assembly’s financial research arm periodically assess the adequacy of this funding target. In 2006 and 2011, the legislature’s Commission on Government Forecasting and Accountability (COGFA) determined that 90% funding was adequate. However, the latest report, issued in November 2016, took a different tack. Instead of providing COGFA’s determination on the funding target, the new report offered the expert opinion of the Commission’s actuary. 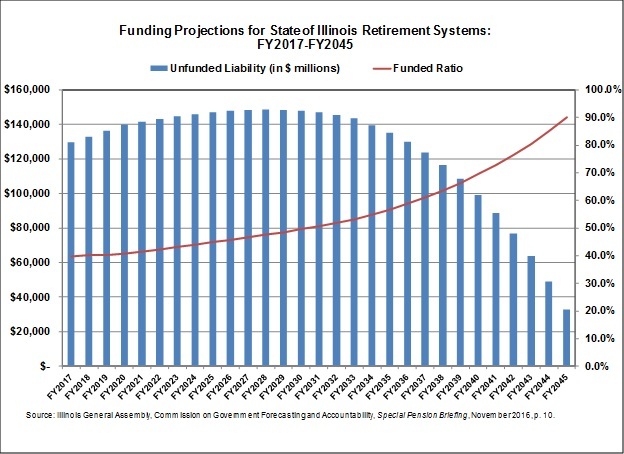 Segal wrote that the 90% goal, in conjunction with other aspects of Illinois’ pension funding methods, was not appropriate and that the State should move to 100% funding for its five retirement systems. As of now, Segal’s opinion does not represent an official Commission position, according to COGFA officials. After the new General Assembly convenes on January 11, 2017, lawmakers on the Commission are expected to address the issue, possibly by holding a hearing or taking a vote. The decision could have significant fiscal consequences for Illinois, which has not had a complete budget for 18 months and has accumulated a staggering backlog of unpaid bills. The amount the State is required to pay in annual pension contributions is based on achieving the 90% funding goal by FY2045. Raising the funding target would require higher State contributions. As discussed previously on this blog, total State pension contributions are expected to increase by nearly $1 billion to $8.8 billion in FY2018. State contributions made from general operating funds and related accounts are projected at $7.9 billion, or 23.6% of those resources, in FY2018. In the new COGFA report, the retirement systems joined Segal in supporting a 100% funding target. Illinois Governor Bruce Rauner’s office opposed an increase in the funding goal “without significant reforms to the pension systems,” citing current fiscal pressures. COGFA’s 2006 report on the 90% target noted that the language was probably based on the results of a 1994 survey by the Public Pension Coordinating Council. The Council found an average funded ratio of 90.2% among the retirement systems surveyed in the summer of 1993. But actuaries and other pension experts distinguish between funding goals and the funded ratios existing at any point in time. According to the American Academy of Actuaries, pension plans should have a strategy in place to achieve 100% funding. Illinois’ State Actuary, which was installed in 2012, has consistently stated that 90% funding does not meet generally accepted actuarial principles. The State’s pension reform law, enacted in December 2013, cut employee benefits but also required 100% funding of pension obligations in 30 years. The Illinois Supreme Court struck down the law in May 2015, ruling that it violated the Illinois Constitution’s prohibition on the impairment of employee benefits. The existing pension law took effect on July 1, 1995. After a 15-year phase-in period, the law requires the State to contribute a level percentage of payroll sufficient to bring the retirement systems’ funded ratios to 90% by FY2045. The State’s funding plan defers a large portion of the required State contributions to future years, which has resulted in growth in the unfunded liability, the estimated benefits not covered by pension assets. Illinois pension funds have consistently ranked as among the worst funded of all the states, including in a recent survey by Bloomberg, which was based on FY2015 data. The five funds’ total unfunded liability stood at almost $19.5 billion, with a combined funded ratio of about 52%, before the law took effect. As discussed here, the total unfunded liability was $126.5 billion as of June 30, 2016 and the combined funded ratio was 39.2%, based on the actuarial value of assets. Besides insufficient State contributions, the unfunded liability has also grown due to changes in actuarial assumptions, poor investment returns and benefit increases, according to COGFA. The following chart shows the retirement systems’ projected total unfunded liability and combined funded ratio from FY2017 to FY2045. The unfunded liability is projected to keep growing through FY2028. It should be noted that the decline in unfunded liability shown above partly reflects the less generous Tier 2 level of benefits provided to employees hired on or after January 1, 2011. These benefits may not be sustainable over the long term. Many Tier 2 members are paying more than the full cost of their benefits, effectively subsidizing the State by helping to pay down its unfunded liability. Most State employees are not currently covered by Social Security, but Tier 2 benefit caps might eventually be considered too low to meet minimum standards for exemption from Social Security coverage.